Probably the most critical item that you will need to purchase as you become a performing live musician is a great pair of speakers. The success of your live band really depends on how well your sound is translating live and the speakers are the voicebox of your band. Today I’m going to tell you about my JBL JRX125 speakers and how well they have served my music. I have owned my JBL JRX125’s for about 2 years now and have had no problems whatsoever with them. Visually the speakers are very nice looking with a rugged 18-guage steel mesh grille and a cloth covering. They have recessed handles on the sides and will accept both 1/4″ and Speakon connectors. The JBL nameplate on the grille and handles is nice and understated and keeps the speakers very professional looking. If you’ve ever had JBL speakers before then you’re familiar with their warm and full sound. 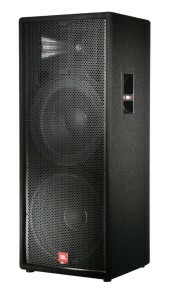 These speakers have the classic JBL sound and their frequency response is perfect for live band situations. They are built with dual 15″ speakers and a Progressive Transition Waveguide horn. Progressive Transition Waveguide is a JBL trademark that simply means the horn is physically designed to deliver “uniform off-axis frequency response to every point withing the intended coverage area” – JBL. This all translates into excellent sound. If you want to check out all the technical specifications then click the link to take a look at the JBL JRX125 Spec Sheet. There are several features that I really love about these speakers. First of all, even though the speaker is a 2-way speaker, it’s wired as a “Qasi 3-Way speaker” with the lower 15″ speaker acting as a subwoofer. The way the two 15″ speakers are crossed over is with the upper 15″ speaker handling the mid-frequencies and bass and the lower 15″ speaker handling bass only. I can tell you from personal experience that these speakers can really pump out the bass and they do it without overloading the room with bass frequencies. The problem with a traditional bi-amped subwoofer system is that you can easily hit your maximum SPL level with the subwoofer and everything after that SPL just muddies up the mix. These speakers give you low, rumbly bass but still keep things well balanced with the mids and highs. You can really do without a separate subwoofer when you’re using the JBL JRX125 speakers and they reproduce the all important mid frequencies incredibly well. Another feature that I really like is the ferro-fluid cooled compression driver with titanium diaphragm in the horn. The high frequencies are suprisingly full and not overly crisp or crackly from the horn. Again, they achieve that classic JBL warmth. The horns are also protected by SonicGuard circuitry so if they’re hit with excess power from a dropped mic or feedback, the circuit will absorb the excess energy without cutting off like breaker protected horns. I like that because it means no waiting for the horns to reset after an overload condition. The JBL JRX125 speaker’s power rating is ideal for club bands with a rating of 500 Watts RMS and 2000 Watts peak power capacity. JBL recommends a power amp of 500 -1000 watts @ 4 ohms. I use a 1000 watt Peavey amplifier with mine and they sound fantastic. The cabinet is very solid and has good mass which combats cabinet rattles and rumbling that you get with cheaper cabinets. The only complaint I have about the JBL JRX125 is the recessed handles. The speakers just aren’t very easy to lug around as they weigh in at 94 lbs. apiece. I always bump my wrist against the top of the handle recess when I haul the speakers with a band member and they’re too heavy and awkward for me to lug around alone. So I would recommend adding some wheels and a rear handle to the speakers to make moving them easier. In summary, I highly recommend the JBL JRX125 Dual 15″ 2-way speaker. They just sound amazing and are worth every penny of the price. Make sure you pick up a pair today! JBL JRX125 Dual 15″ 2-Way Speaker Cabinet PairThis amazing dual 15″ 2-way speaker functions as a quasi 3-way: the upper woofers cover lows and mids, and the lower woofers are crossed so they only cover lows-acting as built-in subwoofers. Progressive Transition WaveGuide horn design for enhanced high-end performance and SonicGuard circuitry to protect driver voice coils from feedback and clipping damage. Built with American-made JBL drivers, beefy JBL crossovers, roadworthy MDF cabinets, heavy-duty recessed handles, curved steel grilles, and rugged carpet covering. The JRX100 speakers are built to withstand the rigors of constant touring while delivering renowned JBL sound night after night. Hey Andrew, that would truly be an excellent pairing to have the JBL jrx125’s with the Mackie FR2500. You would be on the high end of the recommended power for these speakers but it would give you perfect amount of headroom for techno type bass. You would want to run that amp in stereo so that you wouldn’t top the 2000 Watt peak power capacity of the JBL jrx 125’s. Now for the big test… I set the EQ back to where I have been playing my EAWs and swapped out the 125 on the right channel and put an EAW on a tripod right above the 125. I put “Sam Pa Ti” on again and cranked it up very loud. The EAWs definitely put out better highs (I upgraded the tweets to Selenium 200 watts) but the mids and lows on the 125s blew the EAWs away!!! Even though the 125s lost the battle of the highs they were much more than acceptable for use as a mobile DJ. When I went to look at these I went in with the idea that if they were somewhat close to the EAWs I would buy them and I have to say that they are better suited for my use. I will be applying metal corners, upgrading the tweets, replacing the plastic feet with rubber, adding 2 fixed casters to the bottom rear, and a handle on the rear top. Every review I have read (over 100 before I agreed to see these) from owners of these speakers except 1 was very positive. The one complaint everybody seemed to agree on was the weight. Let me tell you about heavy! How about lifting 70 pounds 5′ high to get them on a tripod, then lifting them off after the gig? Now that’s heavy!!! With the caster/handle modification I am doing it allows you to use the handle like a wheel so you can just tip them against your vehicle, grab the bottom and slide them in and out. Did it before with a pair of 160 pound dual 18s I used to have and it worked great. So even though these weigh in at 24 LBs more than the EAWs, the lifting I’ll be doing is actually a lot less! The reviews on DJ forums from people that don’t own them were pretty consistently negative. They are very anti dual 15. They recommend going with the tripod mounted 15s and a pair of subs. After hearing these speakers at the huge volume I played them at I have to say they are nuts! These are awesome speakers. Even though I know I could spend a lot more money and get better sound, these are great speakers and I give them a 9!